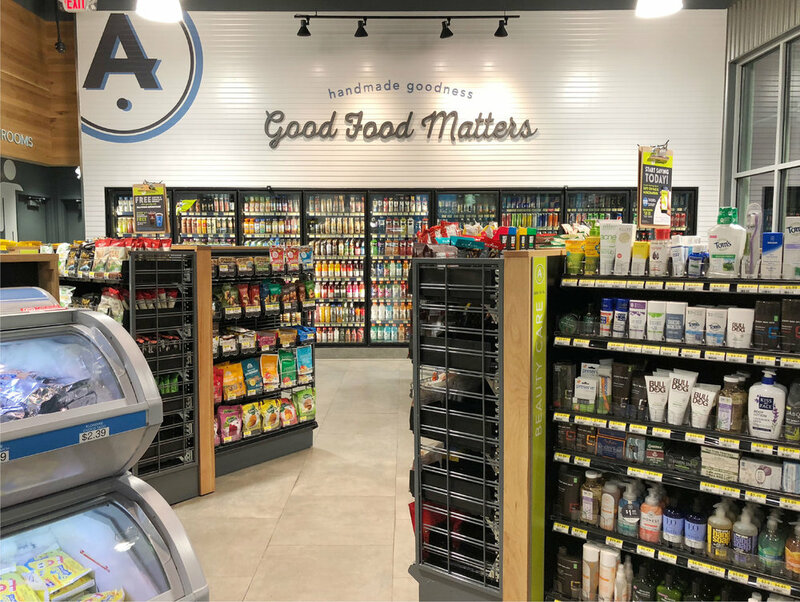 Introduce a new food retail experience to capture the growing demand for higher quality food choices in a state of the art convenience setting. Positioned Centre Street Kitchen as a fresh-prepared food offer that is authentic, contemporary and professional to over come the perceived “gas penalty” of serving food at a fuel location. clap-board siding with metal awnings along the front and a metal roof with darker wood trim frame the entrance on one side and provides a feature wall for the A logo on the other. The interior utilizes a soft blue color pallet and wall tile to highlight the self-serve beverage bar with “taps” vs more traditional soda fountain machines to provide a more crafted and unique customer experience. And independent merchandising pods are used vs more traditional shelving to create a more open flow and making more products visible and more easily accessible.